A desktop computer can be everything to everyone. Whether you want something versatile enough to meet the needs of your whole family, a great display to watch your favorite show or movie, or the perfect partner to help you get your work done, it’s the proven solution to whatever the job calls for. And no matter your goals, HP® has a great selection for you to choose from. 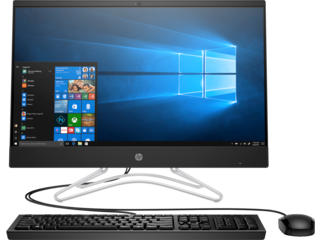 When you choose an HP all-in-one computer, you’ll get everything you need without jumping through hoops, or untangling cables. You remember the days when every desktop needed tons of cables, right? What about the tower powering it all? 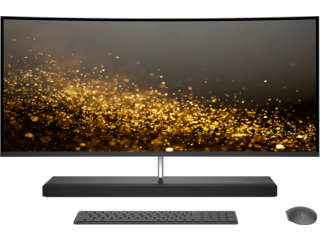 With HP®, no matter your choice, you’ll get a large display you’ll love, powerful sound, and a whole lot more space to kick your feet up and enjoy the experience. With the HP ENVY 34, you can expand your horizons, and see it all with the world’s widest curved all-in-one computer. With a display of almost five million pixels, you can spend your time trying to count each one, but instead we’d recommend seeing them in action watching your favorite show. A Technicolor Color Certified screen means you get a picture that’s as perfect a representation of the real world as looking outside your window. With a design just as beautiful as anything you’re watching on the Ultra-Wide Quad HD display, we wouldn’t blame you if you took a minute to stare after powering it down for the first time. Also, its speakers pump audio at a 45° angle from the base, meaning you’ll get sound clear enough to hear every detail when you press play. 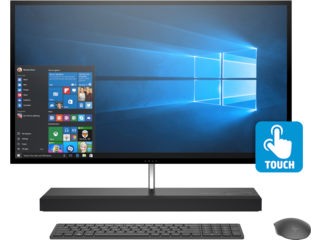 The sleek HP ENVY 27 all-in-one desktop offers its own unique entertainment experience. A 27” diagonal floating glass Micro Edge display and HP quad speakers tuned by Bang & Olufsen will remind you why you have your senses. A 6th Generation Intel® Core™ i Processor, up to 16GB of RAM, and options for SSHD, SSD and HDD storage means you can put all of you into your all-in-one. 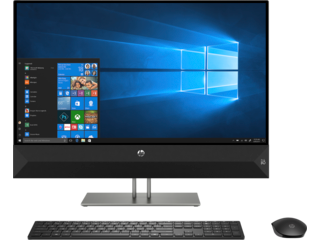 If you’re looking for something different that can balance work and play, an HP Pavilion 27 all-in-one can be just the desktop computer you need to do a whole lot of both. What’s on the inside does count, and under the beauty lies a 7th generation Intel® Core™ processor that keeps you going, browser tab after browser tab, video after video and task after task. With up to 16GB of RAM, even the most demanding days of work can feel a little less so when you know you can rely on your PC to help you get through it. An optional AMD Radeon™ 530 graphics card gives you the juice to tweak that photo until it’s just right, edit that video until every frame is just how you want it, and then do some casual gaming when you’re all done. We all have budgets, and HP® has desktop computers for sale that won’t leave you feeling like you’re making a compromise. You can choose the right model with the right features for yourself, your family, and all of your combined goals. We have 1TB HDD storage to save everything that’s important for everyone using your device. You can choose between models with 4GB or 8GB of memory depending on your resource needs, Intel® or AMD processors, and all you could want in an operating system from Windows 10. And you can protect your investment with the HP Care Pack, providing 24/7 tech support, easy device pick-up and return, and extended warranties. If you’re looking for reliability, power, or even flare, you have several choices that you won’t regret. The perfect desktop computer from HP® is only a click away.